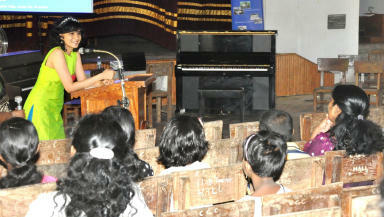 The University of Edinburgh's Dr Tanya Ekanayaka visits Sri Lanka to help heal war affected youngsters. An Edinburgh-based lecturer – who is also a world-renowned pianist – has used her expertise to help the children of formerly war-torn Sri Lanka deal with their experiences. Dr Tanya Ekanayaka, who teaches in both the University of Edinburgh’s linguistics and music departments, returned to the Asian island, her homeland, in August. After making a special appearance at the Colombo Music Festival, she flew to the northern part of the country, where war raged for 25 years until 2009. “I came over for the Colombo music festival along with other artists from all over the world,” said Tanya, speaking from Sri Lanka. The initiative, run mainly by Sri Lankan volunteers, was set up to support war-affected children in north and east Sri Lanka by providing accommodation, education and vocational training. As well as scholarships and study sessions the programme supports learning workshops in a variety of subjects, in a bid to make up for the absence of teachers following the war. “There’s a lack of music teachers qualified to teach instruments, especially in the northern region,” said Tanya. “Culture has been badly affected by the war, at the very practical level of teachers being able to impart skills. The north has lost a lot, many people have left. There’s a lack of musical instruments in schools, and I know these students would love to have the opportunity to learn. “What I wanted to do with the workshop was to try and make young musicians – amateurs, students of music, those who love music – aware of how powerful can be as a way of healing. “In the first part they played, performed and received feedback and in the second I put them into mixed groups and told them how they could create a story using music. They ended up composing little pieces expressing what they felt. Children in the area were born and brought up during the Sri Lankan Civil War, which began in 1983 and wasn't declared over until 2009. Estimated to have resulted in the deaths of 80,000 to 100,000 people, 25 years of fighting between separatist group the Tamil Tigers and the Sri Lankan military also had a severe effect on the country’s population and economy. Considered one of Sri Lanka’s most distinguished classical pianists, Tanya, who first came to the UK six years ago, was also a linguistics lecturer at the University of Peradeniya until 2011. In 2006, she was awarded a scholarship at the University of Edinburgh where she received a doctorate for interdisciplinary research into linguistics and musicology, and where she now teaches part time. Raised in a less volatile part of Sri Lanka than her young students, Tanya began playing the piano at the age of five, going on to perform at the John F Kennedy Centre for the Performing Arts in Washington DC and becoming the first Sri Lankan pianist invited to play at the Pianists of the World series at London’s St Martin in the Fields. “When I was born the war was just about to start and my memories of living here are that the country was at war. There were bombs, I had friends that died, I’ve seen dead people but I witnessed it but to a lesser extent than these children. “You realise that when you spend 25 years in a country that’s at war you become immune to violence because you read about people dying all the time. Everyone in this country has been affected by the war in some way. Tanya, who is returning to Edinburgh later this month, now hopes to develop the workshops into a more long term programme.